“Knives, Lipstick and Liberty – One Woman’s Journey“ (Kindle Version Only) is Jenn’s story, in her own words, on how in five short years she went from not being involved in politics at all to being recognized around the country for her knife advocacy, and her success in changing laws in her own state. Watch state Rep. Jenn Coffey on the floor of the House and you’d think she was swaddled from infancy in the “Don’t Tread on Me” flag. An Andover Republican, Coffey is pro-gun, anti-regulation and well-versed in the Constitution. She could be the poster girl for the Free State Project, the Republican Liberty Caucus and the Second Amendment Sisters. It was Coffey, after all, who sponsored a bill last year requiring the state to post warning signs at the Massachusetts border so gun owners wouldn’t be caught unaware in the anti-gun Bay State. Turns out, that’s the new Jenn Coffey. Seven years ago, Coffey was a Massachusetts resident (true!) who viewed her husband’s political rants about government intrusion as “background noise,” according to an autobiography she’s written. The title is fantastic: Knives, Lipstick and Liberty. The couple argued over radio stations: he wanted to listen to “political crap” and she wanted to hear music. That all changed one day in 2004 when Coffey went to work and had to scan her fingerprints to clock in. Then she started hearing about the Patriot Act. By that summer, the Coffey was on board with her husband and decided to leave Massachusetts. They looked at two states Florida (her pick) and New Hampshire (his). Turns out, Billy Coffey had already been chatting online with New Hampshire Free Staters and had even voted with them in 2003 to make New Hampshire their headquarters Among other things, Coffey’s book shows why the Free State Project is so appealing to newcomers: When the family arrived in New Hampshire, Coffey quietly ill with a medical condition, they were greeted by a huge group of strangers ready to move them in. They’d all connected with the Coffeys through the Free State Project. 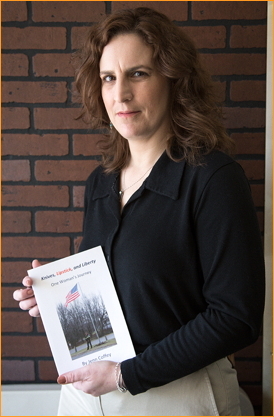 In no time, Coffey was running for state representative, leading the Second Amendment Sisters gun advocacy group, introducing legislation for Pro-Gun New Hampshire and becoming a Republic Liberty Alliance star. Coffey has a nice writing voice, and Knives, Lipstick and Liberty is a quick read complete with appearances from Free Staters, Ron Paul and gun rights activists.